Not having a strict agenda, or any schedule for that fact, is one of the best aspects of traveling. Not vacationing. TRAVELING. 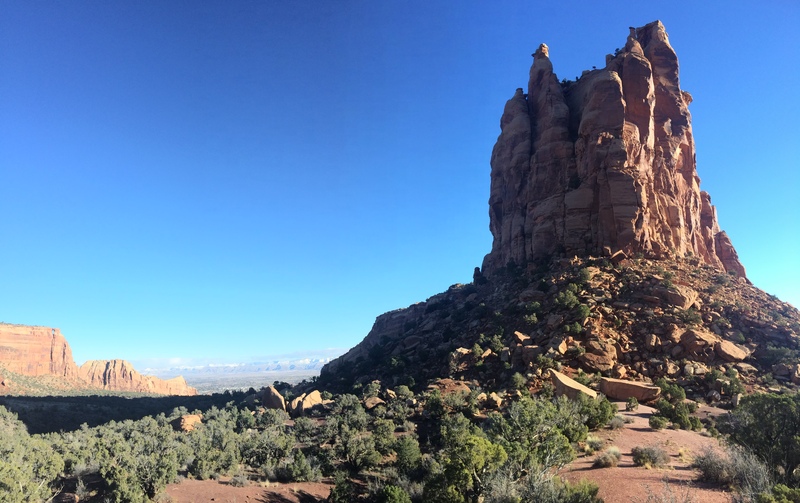 And that is how we stumbled upon the wonders of Colorado National Monument. During our 2014 road trip across the U.S. we hardly spent any time in Colorado. In fact, we only had 3 days to spare for Colorado, which forced us to rush through Rocky Mountain National Park, Denver, and Boulder. Now we had real time (well, more than 3 days) to spend in Colorado, but all in the south. My sites of interest included 3 national parks: the rarely-visited Black Canyon of the Gunnison, the tallest sand dunes in North America at Great Sand Dunes, and the ancient cliff dwellings of Mesa Verde. Along the way between Crystal Geyser and Black Canyon of the Gunnison, we stopped in Fruita so I could run an errand at the post office. 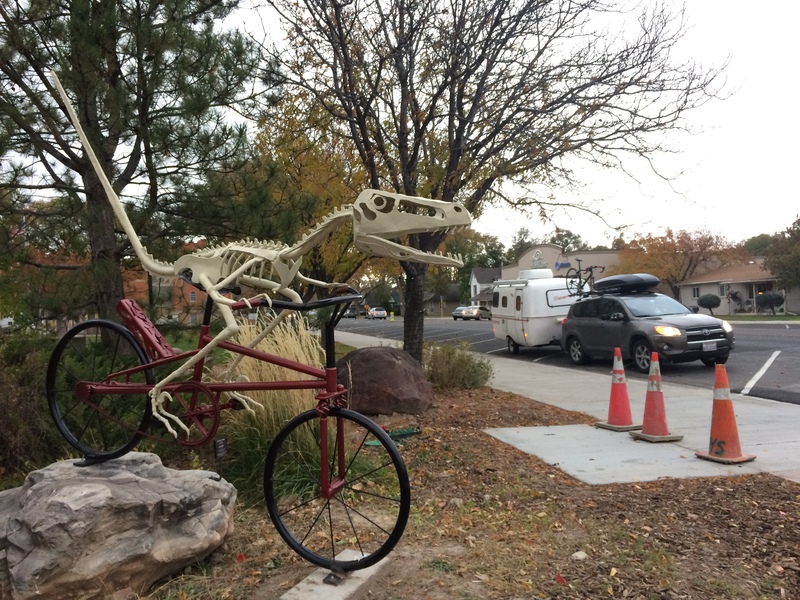 Fruita is apparently known for dinosaurs. 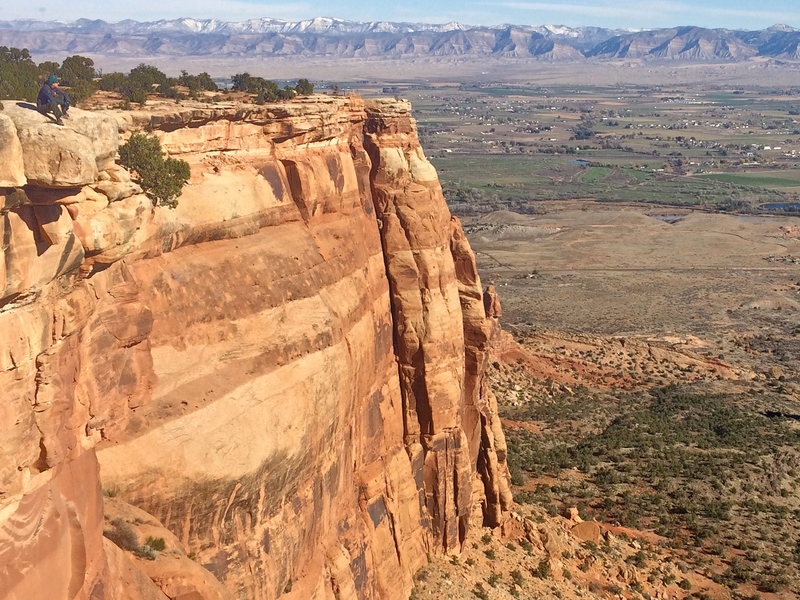 But while in Fruita I quickly learned of the nearby Colorado National Monument. 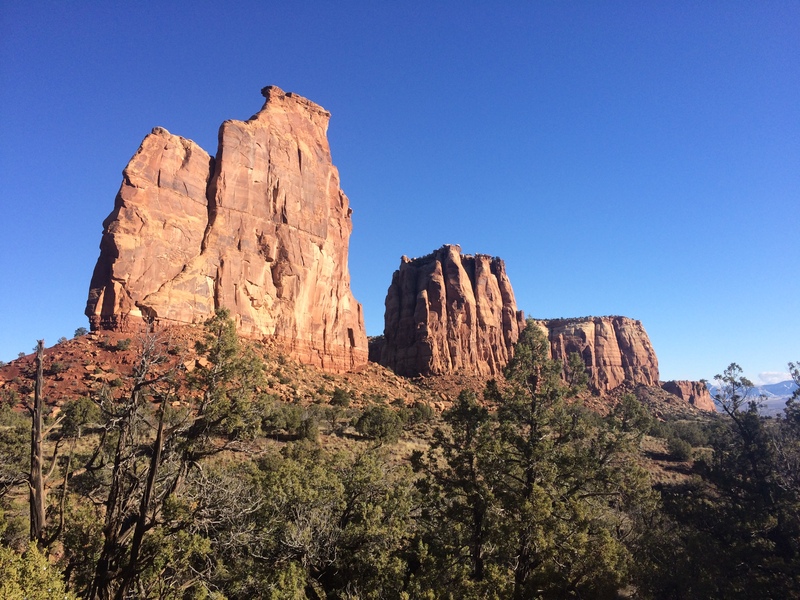 “Want to make a detour to Colorado National Monument?” I asked Chris. And what an amazing detour it was. 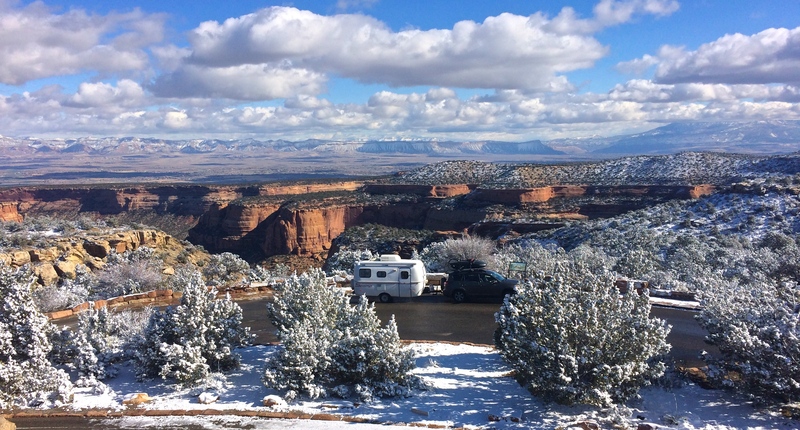 A small winter storm was passing through the night we arrived, dusting the high canyons with fresh snow. Luckily the storm only lasted one night, and the rest of our days at the monument were beautiful and sunny. 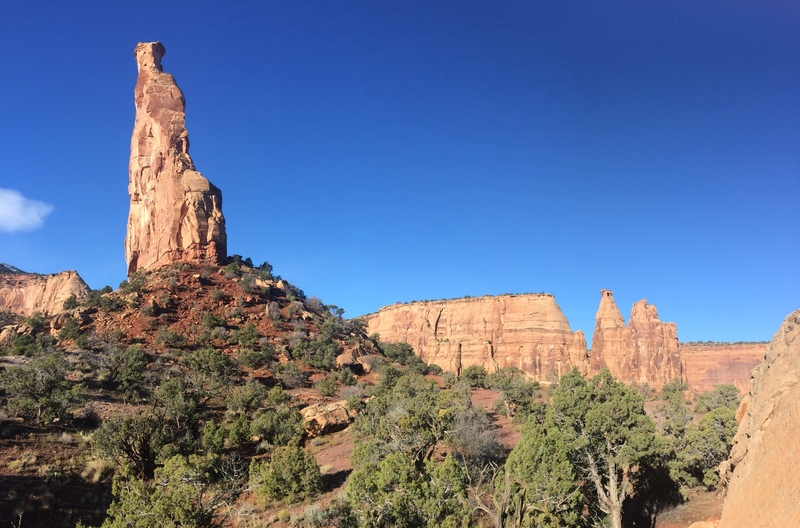 Over the next day and a half I hiked 4 easy trails and biked along the scenic Rim Rock Road at Colorado National Monument. 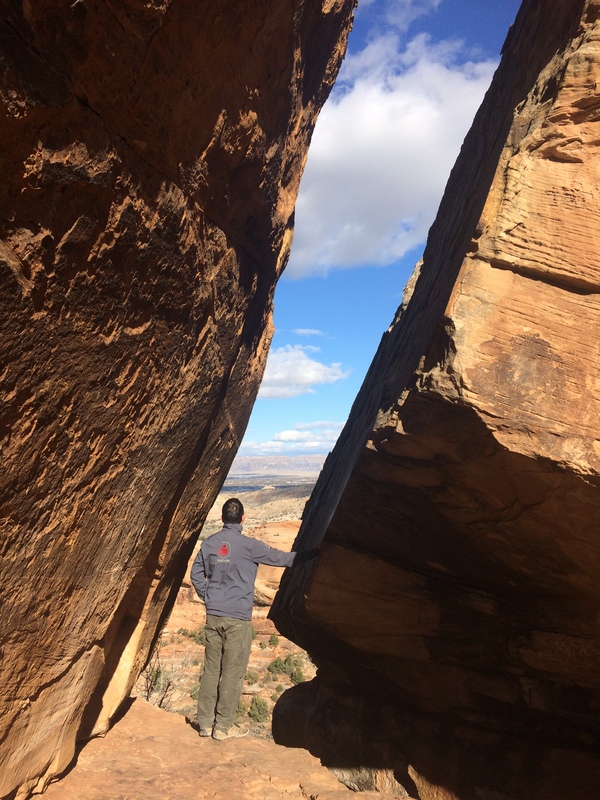 After hunkering down for one night in the town of Fruita during the storm, we ventured into the monument the next morning. Because Chris had to work, I was fortunate to cut trail distances in half; instead of hiking a potentially long loop, I’d start at one end and Chris picked me up at the other end. 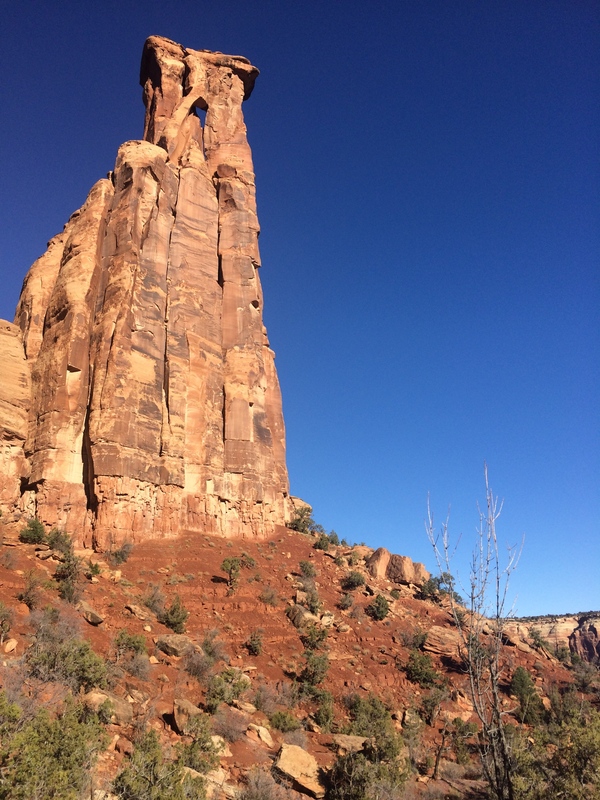 I wanted to see as much as possible, so I got a bright and early start to the 6-mile long Monument Canyon Trail. 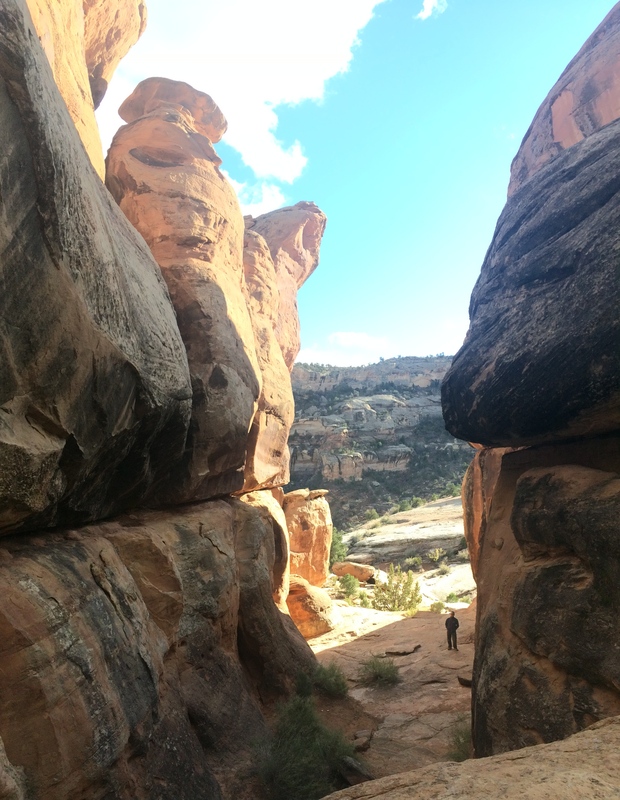 This trail trickled along the floor of the canyon, passed by the notorious Independence and Kissing Couple Monuments, and climbed up 600 feet beside the Coke Ovens to the top of the canyon. 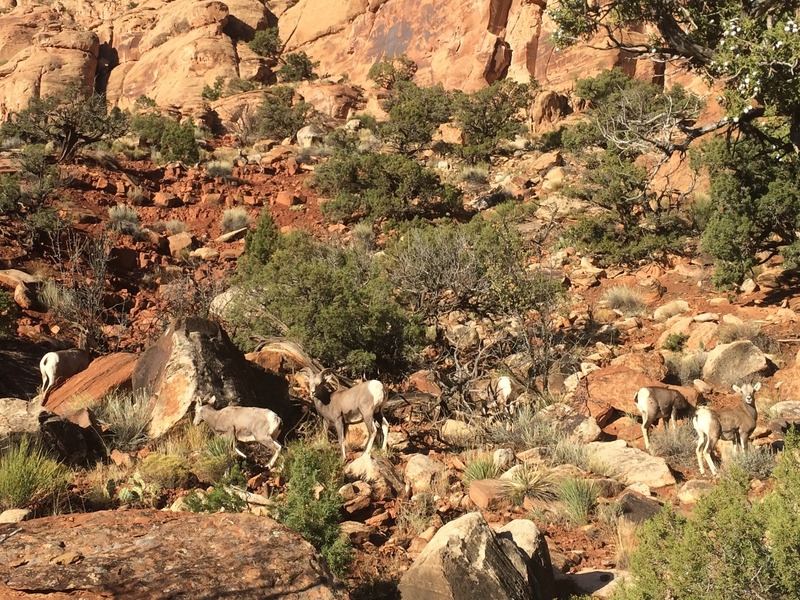 I stumbled upon a bunch of bighorn sheep. Chris met me at the top of the canyon. 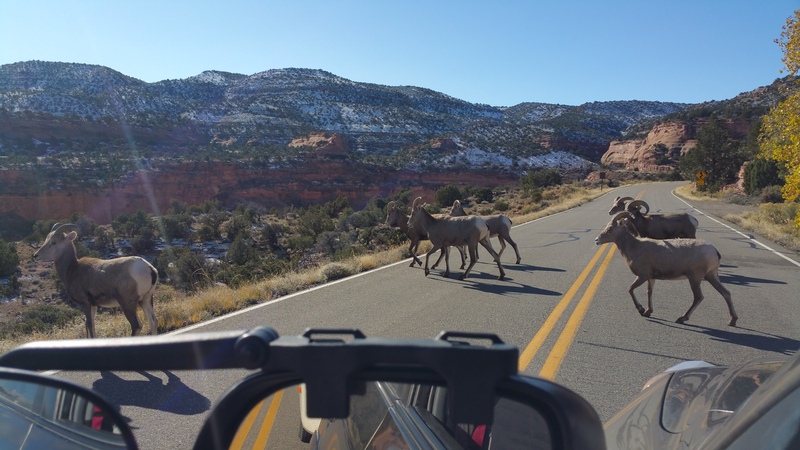 During his drive to meet me, he too stumbled upon bighorn sheep. I later discovered that they love to linger around the visitor center. During the drive, we kept an eye out for the fork in the road. The night before, I carefully studied a map of the park and saw that the road forked 7 miles down from the visitor center. At the fork, the road to the east continued along the monument, but the road to the west immediately became BLM land with a trailhead and enough space to set up camp. 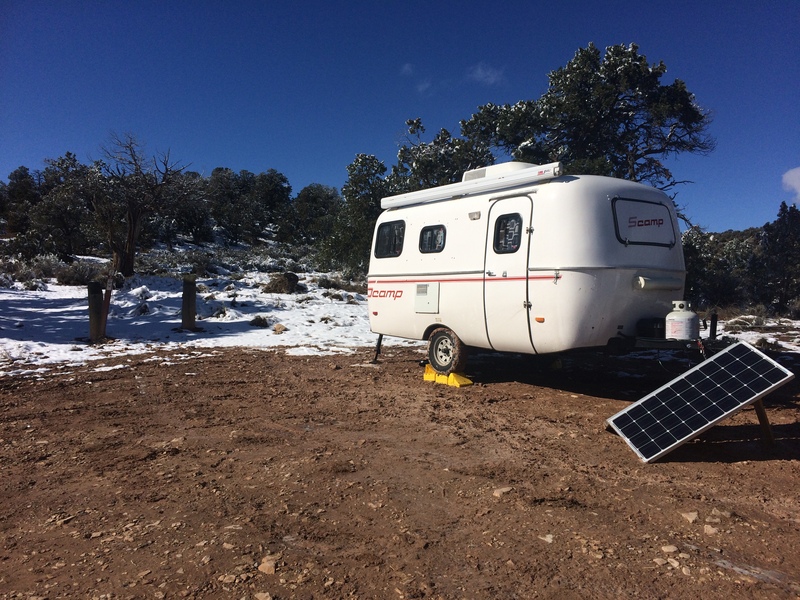 Albeit muddy from the storm, the site was perfect–plenty of sunshine for our solar panels, and even data coverage with our antenna! We unhitched Scromp, quickly scarfed down lunch, and headed back into the park to drive the rest of Rim Rock Road. Once again, I got dropped off at another trailhead–the easy downhill 1.75-mile Serpent’s Trail–and Chris met me at the bottom in the parking lot. 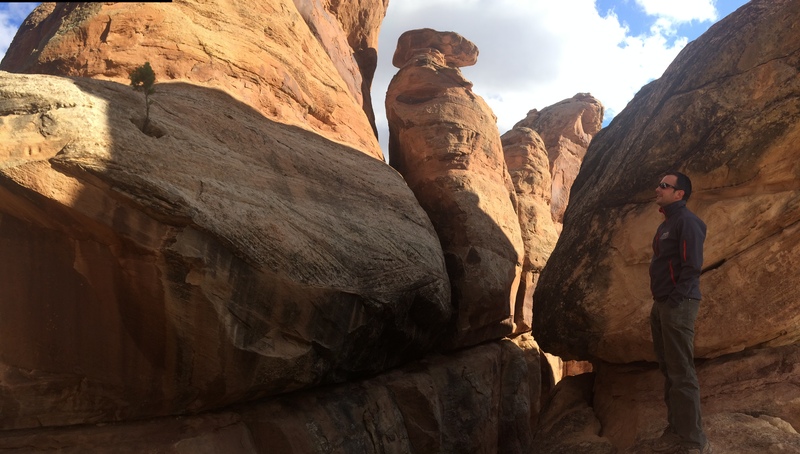 Once in the parking lot, I discovered another short trail–the .8 mile Devil’s Kitchen. A park ranger had told us about how awesome this trail was, so it didn’t take much convincing to get Chris to join me. It was a short hike, but it was awesome just like the park ranger described! The uphill trail basically led us to a natural cathedral of rocks. The views from between the rocks were awesome too. 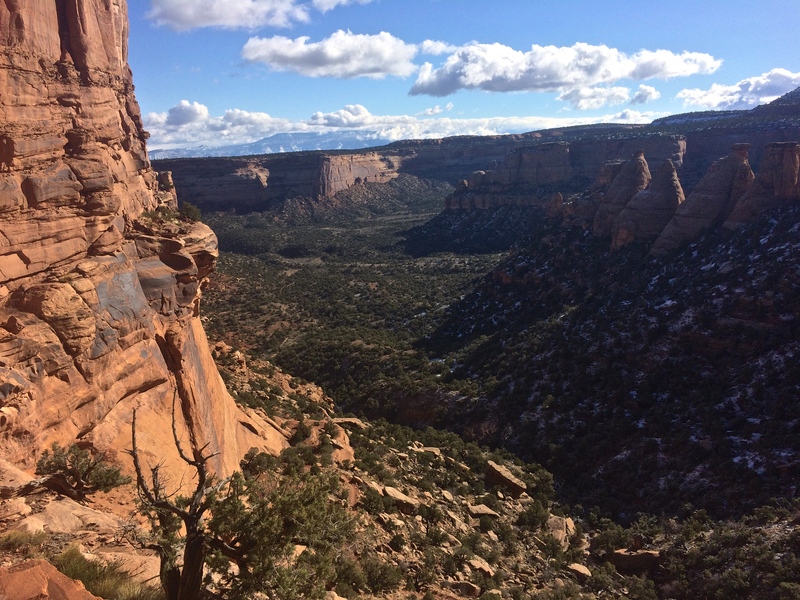 During my first day at Colorado National Monument, I hiked the Monument Canyon Trail, Serpent’s Trail, and Devil’s Kitchen Trail. In addition to the hikes, we drove along Rim Rock Road and found an awesome BLM spot right outside of the park. Little did I know the next day would be equally as amazing. Early the next morning we broke down camp and headed toward Fruita. Once again, the drive along Rim Rock Road was breathtaking. 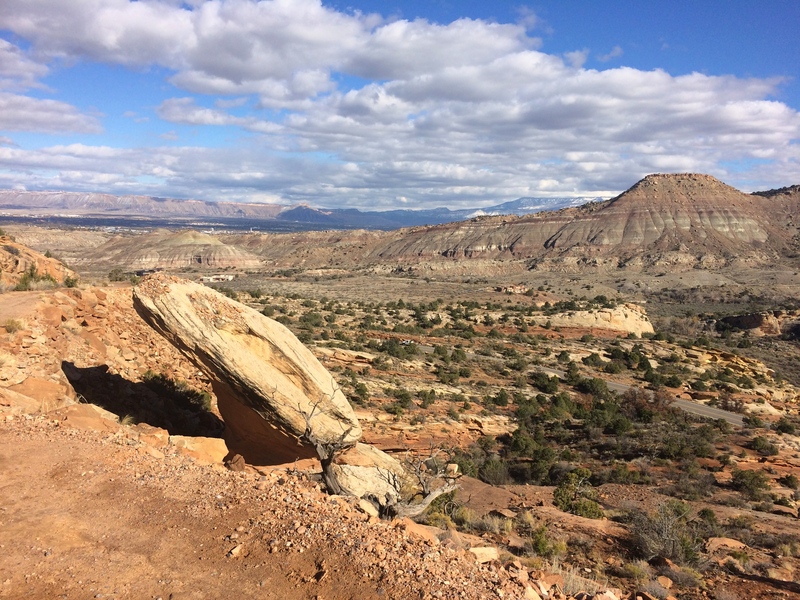 We made a short stop to the visitor center to stroll the half-mile Canyon Rim Trail. This was literally along the canyon rim with steep nerve-wrecking drop offs. 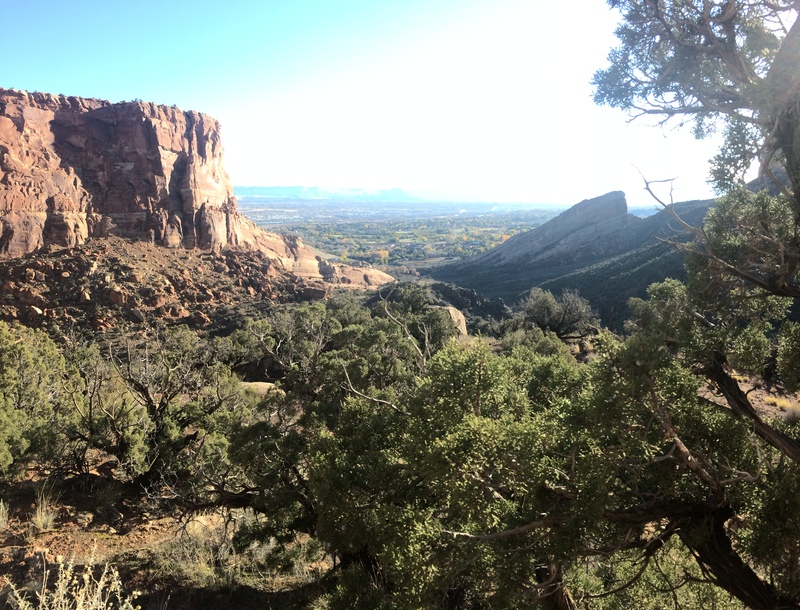 Then we exited the park and drove down the windy road back into Fruita. There, Chris continued to work and I hopped on my bicycle for a quick joy ride back up into the park. Due to the storm leaving behind icy patches of snow on sections of the road, I was unable to cycle the entire Rim Rock Road. 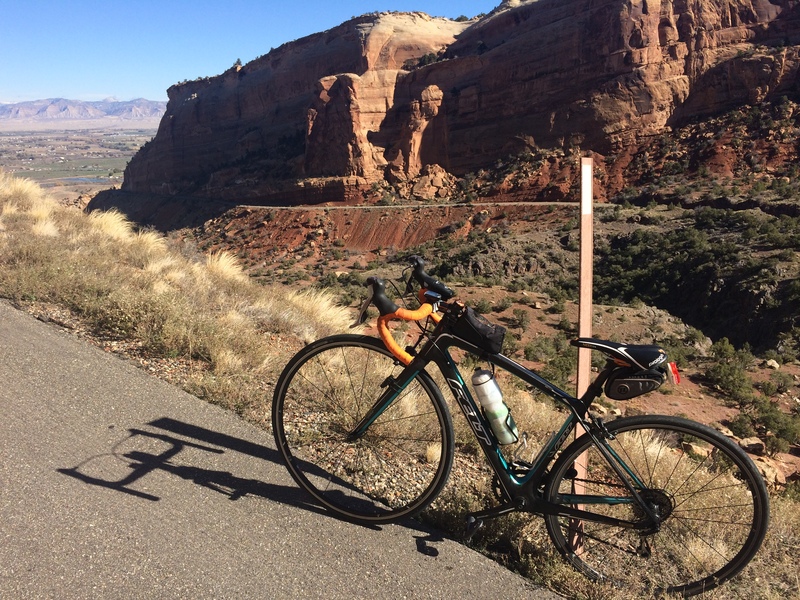 But, I made the best of it and cycled from Fruita to a little past the Independence Monument Lookout and back, totaling a bit over 19 miles. The descent quickly got me back into Fruita, where we lunched and headed out again, east toward the Black Canyon of the Gunnison. Instead of driving directly to Gunnison, we made a slight detour (again!) 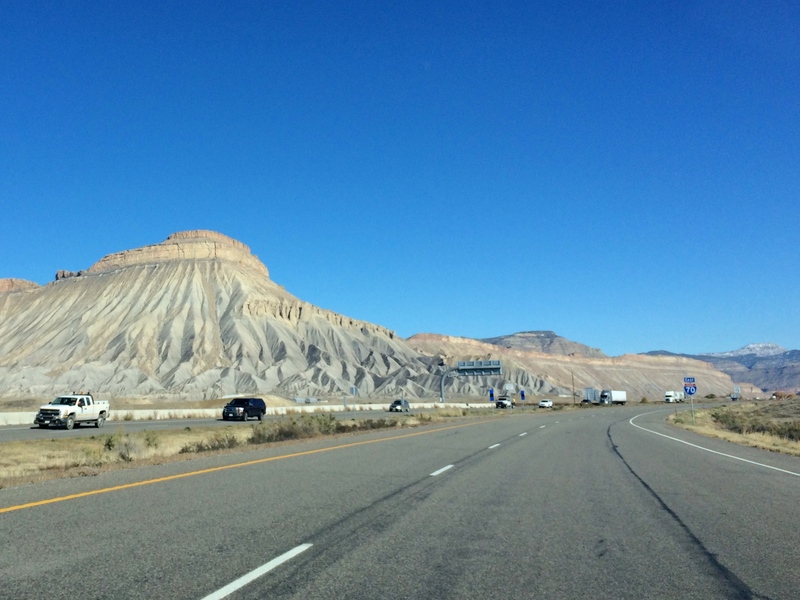 to drive over Grand Mesa, one of the largest flat-top mountains in the world. This isn’t Grand Mesa, but I still found this roadside mountain incredible. Unfortunately due to the storm, everything on Grand Mesa was snow covered and frozen. We literally drove right over it and down to our next BLM site in Montrose, just outside of the Black Canyon of the Gunnison. Naturally, we had the area primarily to ourselves and by the time we finished setting up camp, we had exactly 10 minutes of sunlight remaining. Well, that was an epic last minute detour. 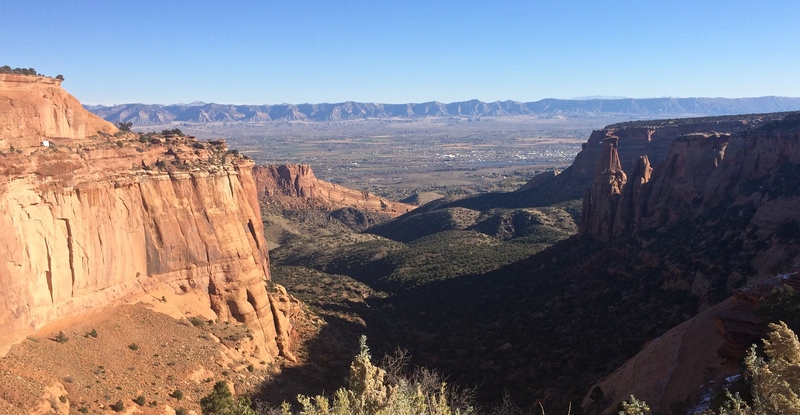 Prior to arriving to Fruita I had never heard of Colorado National Monument. 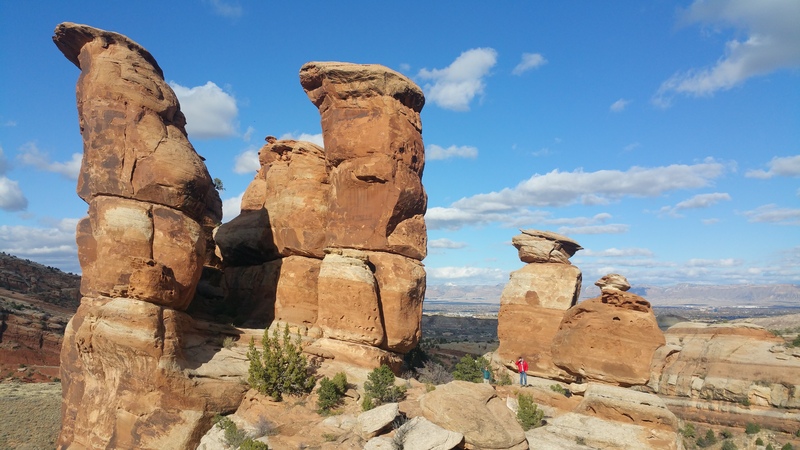 Googling the monument and seeing pictures of its dramatic rock formations enticed me to go…and I was SO stoked to have done 4 short hikes and 1 bike ride during the 1.5 days at the monument. It was nothing short of amazing. 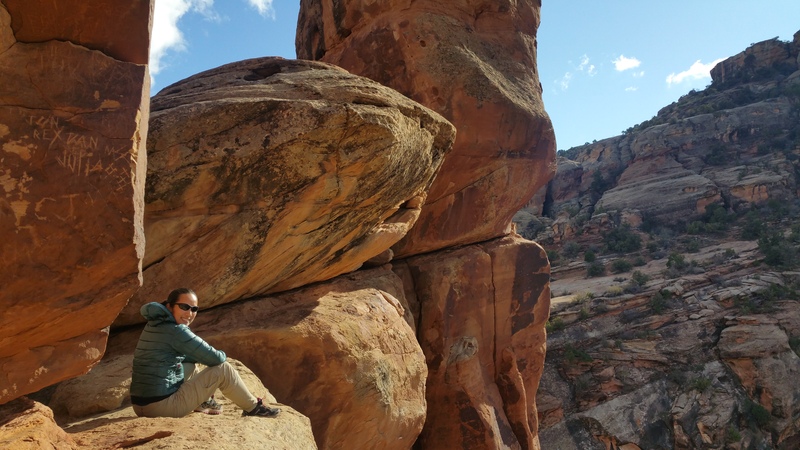 This entry was posted in Colorado and tagged canyon rim trail, devil's kitchen trail, monument canyon trail, serpent's trail. Bookmark the permalink. Super post! I was just looking for hotels near CNM. Now I want to go even more! I am just 2 hours south but want to be there for sunrise and sunset. The campground is still open, but it’s $20. Or you could just camp where we did for free!